They met in the Tent of Meeting. Where’s your Tent of Meeting? Click on the video and I’ll show you. What did Jesus tell you? Just leave your comments in the box below. 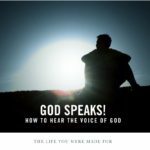 God Speaks has five, 20 minute videos that will lead you into a closer relationship with God as you are guided through the steps to hearing his voice. The most powerful part of this program is the prayer time at the end of each video where you will connect with God on a heart level and listen to his voice. as you say, he says ” I will never leave you “. This little video today is an overwhelmingly ” simple ” lovely thing. hat was wonderful, Jesus said he love me, he said I’m being obedient, I’m thoughtful, I’m lovely, my voice is harmonizing. Thank you for that excerise, its an oppurtunity to look in Jesus face boldly. That he was pleased with me and that he thinks I’m humorous! Thanks Grant, this is a very, practical way to stop in our busy lives and hear God speaks. This is awesome to be in Jesus’s presence. “I love you” “I care about you” “I appreciate you” “I respect you” “I want your best” “I want to hug you” “take away hurts, love you, comfort you”…the list went on and on. Thanks Dr. Mullen – I needed that today!! He says I am pure and set apart for Him! He is pleased I am a good father, grandfather husband team member at work, supporter and encourager. God said cast your cares on Me. I am in the business of restoring broken lives . . then I saw a mozaic vase being made out of beautifully colored broken glass pieces. God takes the broken things and makes us new. He is able . . He loves us! He said I was very kind. That I am smart, brilliant and I have what it takes to make it in this world. The Lord Bless you Grant, you are awesome! I love you with an everlasting love and with loving kindness have I drawn you. Jeremiah 31. Thanks grant. Jesus said You have done well my daughter. I’m proud of you. I now know what to work on and pray for. Thanks Grant for this awesome video series. I have recommended it to two groups I’m involved in as a “study”. I love the way you just DO IT!! It is so simple but if we don’t try it we will never know how easy it is. Dave and I listened and followed the questions in two nights ..your speaking and teaching was so intrigueing and so simple we couldn’t stop. If any of you people are hesitating to buy this series, I want to encourage you to just buy it. If every Christian had developed this close relationship with God that Grant encourages in us …there would be a REVIVAL!! I have let God lead me for many years but had not really deliberately asked Him such pointed questions and not audibly heard His voice until now. This deepens my ability to hear His voice clearly.Thanks again Grant. “I think you’re wonderful and lovely! You are so beautiful and emotive. Your imagination is so flexible and strong – you use it regularly. I like that. You can create amazing places where we can go and be together. I feel your unique love through your musicality and I love to just sit and smile at you while you sing to me. He told me He loves me and that I am beautiful. However, He said that I have trust issues, so I prayed for deliverance from it. I have had bad treatment from men all my life, including my present husband who is an alcoholic, among other things. I should add that I have no trouble forgiving people. I wish that there was an Alanon group for Christians. No church that I know of has one. It’s the DAILY struggle that gets to me. I never know what’s going to happen, when the next calamity will be. I think I’m grieving, in a way. I’m crazy about you! I’m here for you always. You are safe with me.Don’t be afraid. I cast my eyes on the certificates in my den from from Yardenit, the baptismal site on the Jordan River where I was baptised in the year 2000 and the Jerusalem Pilgrim Certificate and a Certificate of the Catholic Faith Formation Program. Your mail today was most timely as I just returned from the doctor . I paused the video, focused on Jesus and my health concerns and within seconds His message was clear,” I am with you”. A peaceful calm entered my being as assuredly I am in his loving care. I thought I would comment about Linda that’s looking for a Christian al-anon. There is one it is called Celebrate Recovery, and it’s not just to do with alcoholism, it’s for any hurts, habits and hang ups. In Kitchener/Waterloo there is 3 different churches that have this. Just google celebrate recovery and you might find one in your city. I hope you’ve discovered that it’s so much easier to hear God’s voice than you thought!!!! Keep up the dialogue with him. Dad, This was a great video. It is a solid excersize and a tremendous tool for building faith. I am very thankful that you taught me about it at such a young age. You are the best! I adore you. You are everything to me. EVERYTHING. I have loved you with an everlasting love. You are my beloved. You are an amazing girl. I knew you before the world began. You are precious in my sight. Wherever you go, there I am. I am always with you. I will never forsake you. Wow! Jesus said I was precious and loved. These words were so important to me because I have such anxiety which I don’t know where it comes from and I thought Jesus did not love me because of that. Thank you Grant for sending out this video and letting the Triune God use you and your wife so mightily! I love you so much, Beth. I care for your every need. I am always with you and will never leave you or forsake you. I am with you in good times and in bad. I am your healer who wants to heal your broken heart and broken body. Come to me for everything. I am always here for you – to listen – to be your best friend – closer than a brother. I paid a price for you and you are precious to me.Always remember this – yes – you are precious to me my beloved child! My precious Bride. I love you soooooo much. I want you with me forever. Come to me. Come to me often. I want you to know me, to really, really know me. I feel the longing in your heart. It’s in my heart too. I long for your constant companionship. Take my hand. Come walk with me in the meadow. Your work will wait. Right now, this is more important. I love you! I love you. You are precious in my sight. You are altogether lovely. Your voice, your words, your love for Me excites Me. Never forget how much I treasure you and love you as My very own. There is no-one else like you. I made you because I wanted you. I just enjoy being with you. Come to Me often and enjoy being with Me. I am preparing you for all eternity. We are one. thank-you for your wonderful ministry. God has given me Isaiah 30:18, 19 over the last couple of days … asI have believed through adversity and a lot of emotional pain that “He longs to give be gracious to me and he rises to show me compassion”. He has used your ministry to bring me back into His presence. He says that He loves me with an everlasting love and that He will not go away! (Praise God). He told me that he needs me, and that he wants me to believe that I am precious. He was so polite and lovely …. of course. He said I was a jewel and that he loves me tenderly. Most of all, I was just totally O.V.E.R.C.O.M.E. by his deep love and just His presence. Thanks for sharing the simple exercise. God bless to you and Kathy. What Jesus said to me: I feel joyful, protective, like hugging you and holding you close. I love you. I forgive you. I want to be your friend. I want to restore your heart, and your mind, and your body completely. I want to give you my peace. I want to give you my wisdom, from our Heavenly Father. I have already given all this to you, and so much more. Call on me and you will remember what I have done for you, and how I feel about you. I restore your faith everyday. I enjoy being with you always, everywhere, forever. You are mine and I am yours. You are never alone, Mary-Margaret. Love, Jesus. 2. I desire your happiness. 3. I will never leave you. I have loved you sweet daughter with an everlasting love!!!! Your super! I love you so much! I’m holding your hand right now leading you to where I want you to be. I am with you always, you need not be afraid of anything. You are my sweet little girl I am your Father and I will never leave you.You are saved my royal daughter, I think you are wonderful my sweet little girl (doll, angel, baby). I have wonderful things ahead for you. You will always be my sweet baby girl! You will be with me in heaven! You are precious and loved. You will be happy. I am so in you and you have all of me. You will be with me forever, I will never be done with you, I love you so! Jesus said to me “I love you with an EVERLASTING LOVE.. He thinks I’m to die for! Jesus said “Precious. You are precious. I like you.” I thought it was neat that Jesus said “I like you”, because it meant that He enjoys my company. I laughed when I started the video again and Grant said “Jesus likes you”. So cool. Lean not upon your own understandings. Give grace as I give it. Let not your heart be troubled, I will make a way where there seems to be no way. Grant, your instructions remind me of the “Hearing God’s Voice” course rom Mark Virkler which I am just finishing. Thanks for these great reports! Glad you’ve discovered your Tents of Meeting. You’re right Alma. They should remind you of Mark Virkler’s course. His teaching on this subject had a profound impact on me and I love how simple he makes it. I thought your “How many weeks did you have to fast and pray to convince God to speak with you?…” comment was (sadly) hilarious!!! I wish I knew how to hear God 20 yrs ago….then I wouldn’t have had to spend many nights hungry! Thank you Jesus for Grant and Kathy!!! When I asked Jesus how He felt about me I had a picture in my mind of a red happy face emoticon blowing kisses to me. Lord, you are INCREDIBLE!!! I think He says: Trust me. And that He is greater than all my messed up feelings. He is holding me, everything I am and feel. I love you. I am always with you. My daily relationship with Jesus changed dramatically when I accepted Jesus’ offer to accompany me into my regular daily routine from my quiet time. His presence was so profound that day that it was evidenced by the smell of insense where no one else could smell it. This was a major step away from the enclave sorrounding the gates of heaven and striking out on the path of sanctification. It all started with learning to hear the voice of Jesus in those quiet times! Thx Grant, good instruction. To be honest, I had a sketical reaction to getting a response to this experiment. I know that I have been a disappointment to God recently and I didn’t expect to hear from him at all. I gave it a try however and I DID receive an answer. God told me some very specific and beautiful things that touched my heart deeply. He also reassured me of His love for me and challenged me to allow Him to continually reveal that love. It was a message that I desperately needed right now. At first when I looked Jesus was far away to my left across the room. Something was holding onto my left arm., but as was Jesus approaching me, he was saying “I love you. I am comingI Do not be afraid! He came up to my face but I could not see his face clearly but he removed whatever was dark on my left and covering my hand and I heard comfort, love and hope.